We welcome back Danny with an extra long podcast that is so epic it had to be split into two parts! In the first half the boys tackle the comics of the week and have a chat about Sucker Punch. In part two we go old school with media. 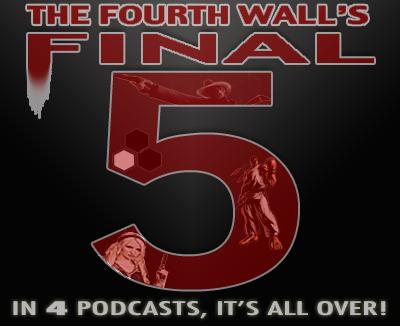 Listen as the final five begins! 120 podcast, 120 minuets and 20 books. The boys strap themselves in for the longest podcast yet as they go over books not just from last week but the week before! Hear as they get happy with Lil’ Depressed boy and talk a long time about Stuff of Legend. Also big announcements are made as a new dawn for the Fourth Wall begins. Episode 81 – right here! Once again, an indie book claims the title of “Big Book of the Week.” Not even Siege can stop Indie’s relentless reign. Our segments are now separated for your listening pleasure. In this podcast we discuss: Final Crisis #1, Batman #677, Green Lantern #31, Batman: Gotham After Midnight #1, All Star Superman #11, and Ultimate Spider-Man #122. There will be spoilers! Battlestar Galactica: s4e9 – Guess What’s Coming To Dinner?